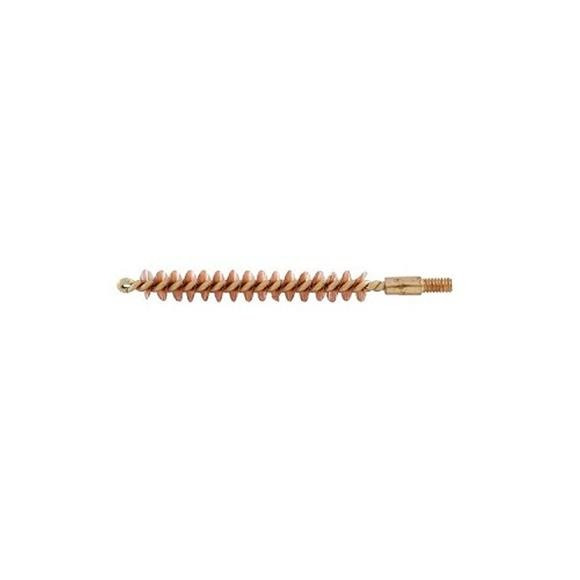 Brass core and bronze bristles (Benchrest Type) designed for competition shooters to withstand frequent use. Construction consists of a high quality brass core and coupling with bronze bristles. Pro-Shot's benchrest quality brush has been used for many years with several world records to its credit. Brass core and bronze bristles (Benchrest Type) designed for competition shooters to withstand frequent use. Construction consists of a high quality brass core and coupling with bronze bristles. Pro-Shot &apos;s benchrest quality brush has been used for many years with several world records to its credit. This bore brush is exceptional for bore cleaning with superior cleaning ability and it will not harm the bore. All Pro-Shot Benchrest Bore Cleaning Brushes have a specific size for each caliber with each brush being oversized for extended life. Brass Core/Bronze Bristles: Pro-Shot&apos;s brush cleans the barrel completely. A brass core brush holds the bristles tighter resulting in a longer lasting, better cleaning brush versus brushes with aluminum cores. The bronze bristles add to that strength in cleaning and longer brush life. Bristle Size/Distribution: filled with superior over-sized bronze bristles that are larger than standard with more bristles per inch. This allows for a tighter fitting, longer lasting brush. Watch us out-clean the competition! Brass Coupling: brass coupling is made to hold the core longer and tighter. It also has precision threads to keep the brush screwed in for all the passes needed to clean the firearm. No Aluminum: these brushes are constructed without the use of any aluminum. Aluminum is softer and more malleable. This results in quicker wear, easily bendable cores, and poor coupling strength when compared to brass/bronze counterparts. Have no fear, the metals used in Pro-Shot&apos;s brushes are still softer than barrel steel and will not harm the firearm.